Here is an interesting twist in the complex relationship between government, gun violence, and Hollywood. There is a new approach to gun control – and it is inspired by the movies. All sensible people , even 90 percent of Americans, agree that individuals who suffer from mental illness should not be allowed to buy guns. By all counts, Adam Lanza would not have been able to purchase firearms; he suffered from Asperger’s and sensory integration disorder. But the guns he used in the Sandy Hook shooting last December were stolen from his mother’s house before he killed her. So how do we prevent individuals who are prone to violence from stealing or borrowing guns from those who would easily pass a background check? It seems impossible. In the most recent James Bond thriller “Skyfall,” 007 packs a pistol coded to his palm print that fires only when he holds it — a high-tech feature that saves his life when the gun falls into the wrong hands. Yesterday, Congressman John Tierney introduced a bill that could make that technology a common feature of handguns in the next two years. The bill would not restrict gun ownership or infringe on a gun owner’s Second Amendment rights, Tierney said in announcing the legislation during a conference call with advocates of gun violence prevention. It’s a move meant to make gun ownership safer, he said. “The bill itself just seeks to personalize handguns,” Tierney said. The press release cites some compelling statistics. 17 percent of law enforcement officers killed last year had their own guns turned on them. According to Tierney’s analysis, smart gun technology could eliminate approximately 11,000 gun deaths per year. Smart-gun technology would also prevent some accidental deaths, such as the case in New Jersey last month when a six-year old accidentally shot and killed a four-year-old child. 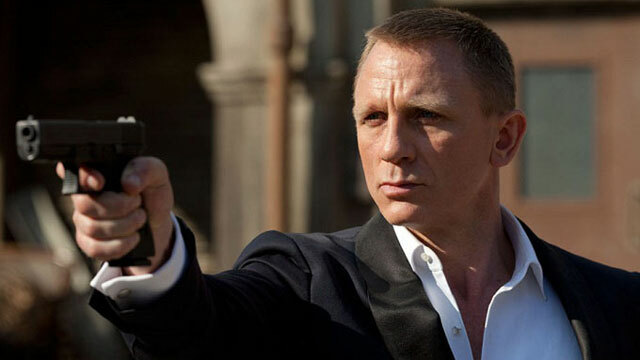 In Skyfall, the technology saved Bond when his gun was knocked out of his hand and picked up by a villain. The gun refused to fire, and the villain was then eaten by a Komodo dragon. Of course, the problem is that technology does not yet exist. If it did, it wouldn’t have seemed so damn cool in Skyfall. The bill, called the Personalized Handgun Safety Act of 2013, is at best a sensible piece of wish-fulfillment. It would authorize grants through the National Institute of Justice to develop the technology, direct the Consumer Product Safety Commission to develop a smart-gun safety standard, and then finally require that all handguns manufactured in the U.S. comply with that standard within two years. I can’t tell if this is really cool or just sad. Movie studios get a lot of flak for being unable to come up with new ideas, but what does it say when Congress is taking their cues from Hollywood? To see one of James Bond’s famous gadgets be pitched as a legislative solution to gun control illuminates the convergence of politics and entertainment, but it also shows just how dire the gun control situation on Capitol Hill has become. Members of Congress are now looking to the movies for solutions. Regardless, it is extremely unlikely that this bill will get any traction in the Republican-controlled House, as the NRA can and will shut down any serious debate on the matter. If you want to see progress being made these days, it seems you are better off going to the movies. You can read a bit more about this technology here. ← The Return of the Right-Wing Action Hero? And what percentage of cops killed with a gun are suicides? Don’t hear much about that in the press, but from what I have read your average cop a) will never fire a gun in the line of duty in their entire career, and b) a cop is more likely to die from their own gun via suicide than be killed by a criminal. I sure the hell hope so. We’ve spent centuries doing everything possible to learn how to make firearms reliable. When you pull the trigger with some thug coming at you the damn thing better go “bang!” You don’t want some fancy technology that just happens to fail at the wrong time. And of course, let’s not mention how much more expensive such technology would firearms. I guess that is discrimination against the poor – you have to have a lot of money to be able to have a firearm to protect yourself or your family.